Easily create amazing slideshows from your photos and videos! 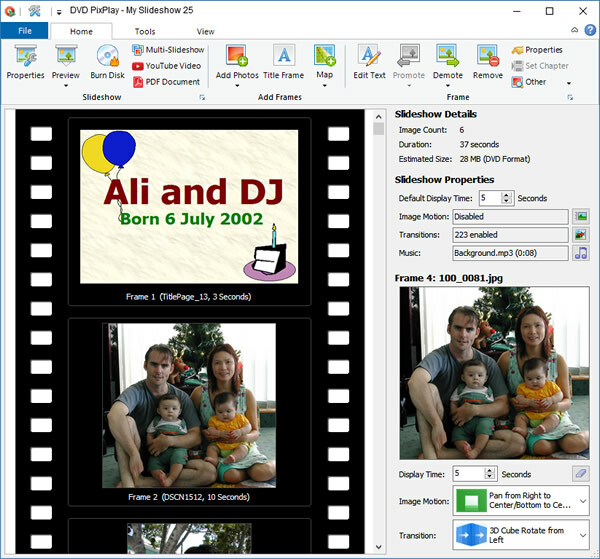 Create slideshows from your photos, videos, and music, and burn them directly to a disc for your DVD player, or upload them to YouTube. Your family and friends can play your slideshow discs on their TV, or on their computer. With DVD PixPlay, you can personalized discs that are as easy to use as an ordinary DVD. With more than 50 image motion effects and 180 transition effects, you can send your friends and family thoughtful keepsakes that they will cherish forever. Add captions to your photos or automatically use your descriptions from Smart Pix Manager, Picasa, PhotoShop, etc. DVD PixPlay is simple to use, renders excellent quality and is superb value for the money. I highly recommend buying a copy of DVD PixPlay, as the program is definitely a solid five in our rating and worth three times the price. Your software has proved indispensable for creating photo disks to send to relatives that live far away, and just for the pure enjoyment of creating lasting gifts for my immediate family and other friends. I have experimented with many other programs, and found DVD PixPlay as close to perfect as they come. Thanks again. I am thrilled with the program and your support. Just wanted to tell you that I made a dvd for my grandmothers 75th birthday and everyone loved it! Thank you! Wish all software companies had your customer service. Well Done! My wife and I are amateur photographers and yours is the best program that we have used. Thanks again. I'm glad to see there are companies out there who understand the importance of good customer service!